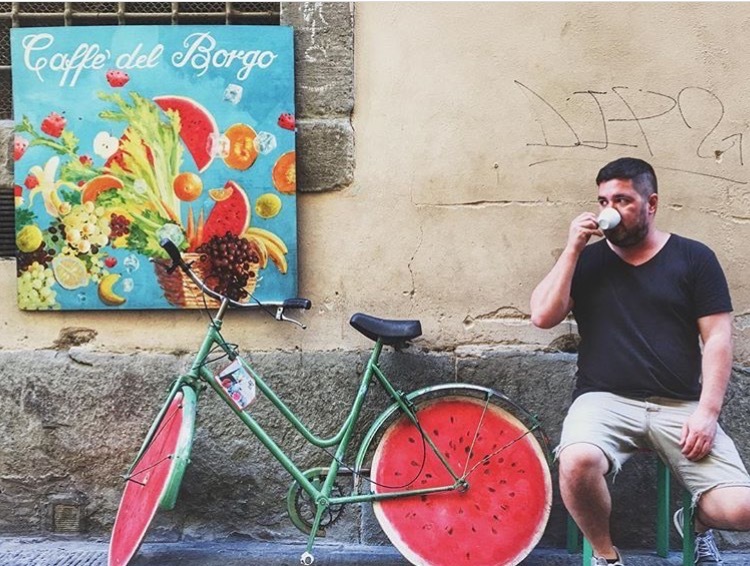 When I first moved to Merida, Mexico, I thought I knew what to expect from the food. I mean, we’ve all had Mexican food, and we love it, right? But I quickly learned that Yucatan food is very different from the food you find in the rest of Mexico. Yucatecan, or modern-day Mayan food, has several core ingredients: habanero peppers, citrus, achiote (a spice used for flavor and color) and smoke. These core ingredients combine to impart flavors and create Yucatecan dishes truly unique to this part of Mexico. Mayan dishes most often use turkey, pork and chicken, though many fish dishes can be found along the coast. Some Yucatan foods, such as the pibihuas, are difficult to find outside of the region, while others are readily available. There are so many foods unique to this area, and in this post, I’m going to share my favorite Mayan dishes with you. 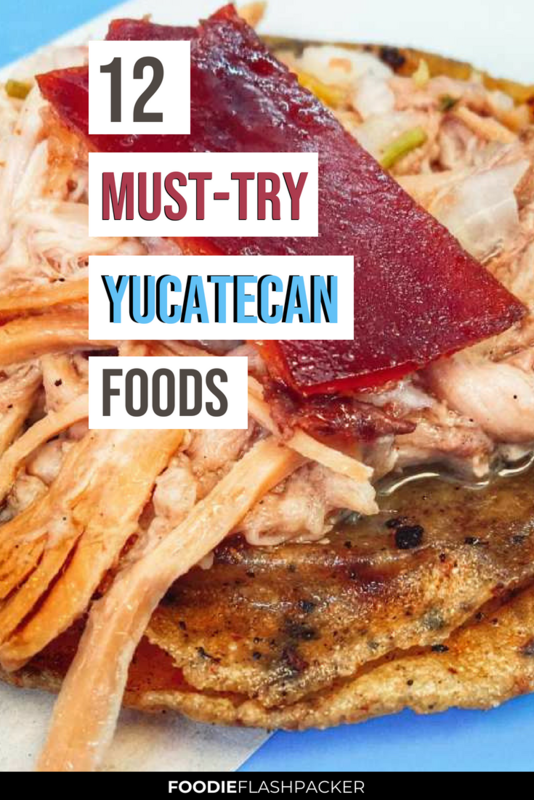 Consider these the absolute must try Yucatan foods to seek out during your visit to the region! Salbutes are corn tortillas that have been deep-fried until they puff up. They’re then topped meat (often chicken or turkey) and onion and (of course) doused in salsa. Panuchos are a lot like salbutes, but they’re stuffed with black beans before being fried. 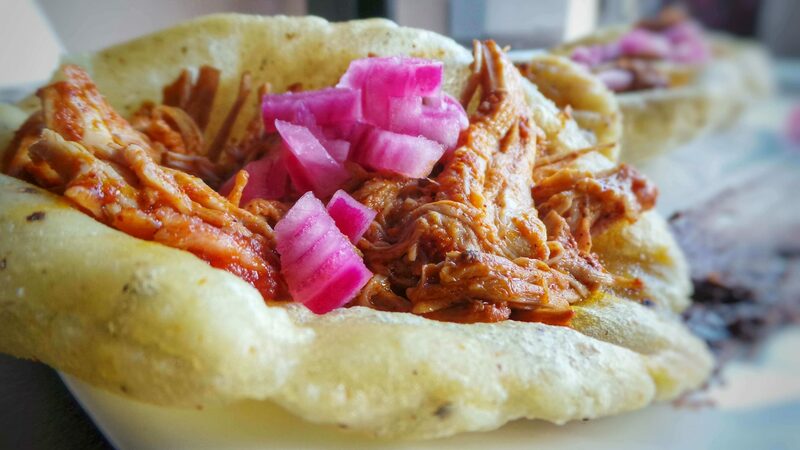 After these stuffed tortillas are pulled from the fryer, they are topped with your choice of meats, chopped cabbage or lettuce, tomato, and the ubiquitous pickled red onion. 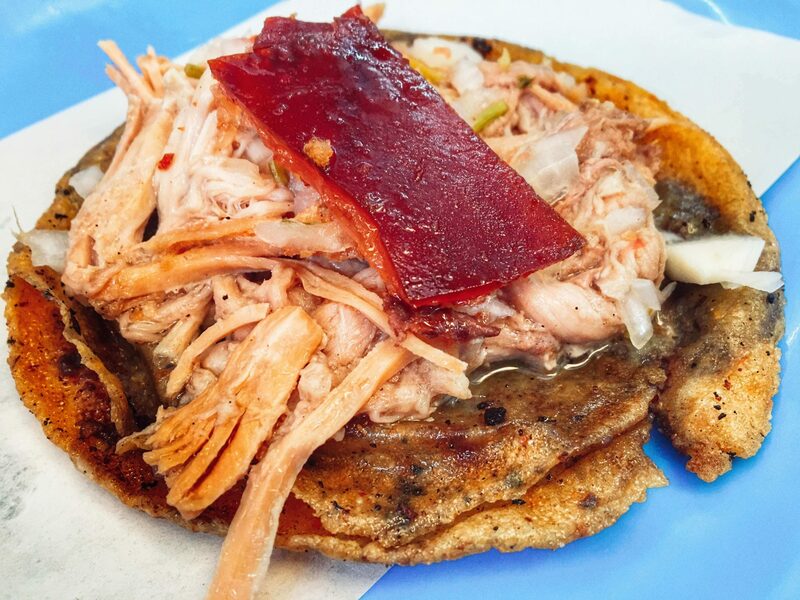 My favorite panuchos (probably because they are the unhealthiest) are topped with lechon (slow roasted pork) and crispy pork skin. 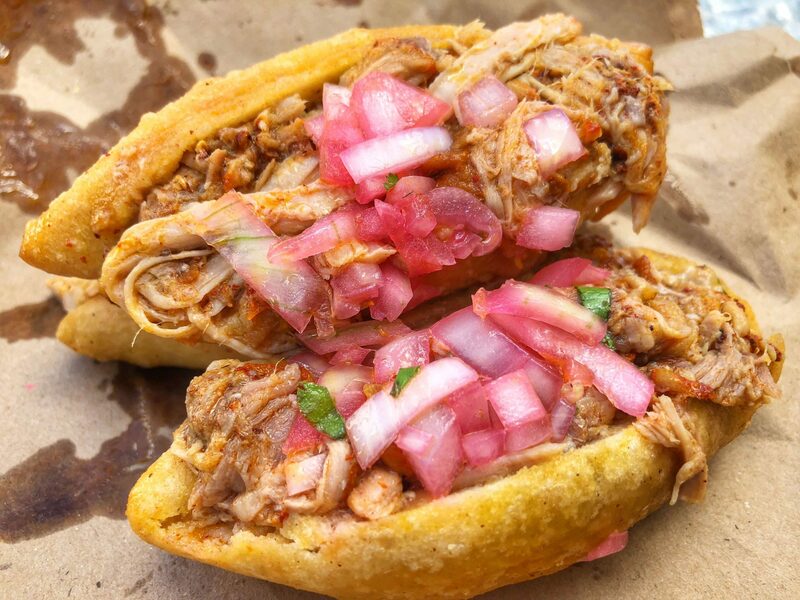 Where to find: Panuchos can be found in every market in the Yucatan, but my absolute favorites were at La Lupita’s in Parque Santiago in Merida. Sopa de Lima, or Lime Soup, is a broth-based soup made from a local lime. Don’t worry, it’s likely much less sour and acidic than those you are likely used to. The soup contains bits of roasted chicken and is topped with pieces of crispy fried tortillas. It is often served at breakfast, as a side to your main dish. If I had to pick my absolute favorite Yucatan food, it would likely be the fried octopus ceviche. I can’t tell you how many times I have had this dish. I still haven’t grown tired of it. 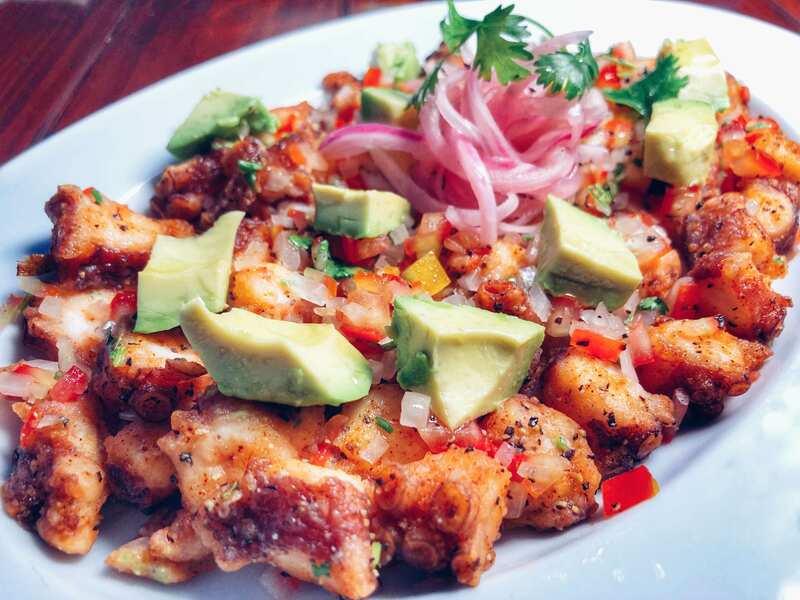 Rather than making ceviche with raw fish, as you’re likely used to, the Yucatecan version adds crispy pan-fried octopus to the traditional ceviche mix of onion, lots of lime juice, tomato and cilantro. Make sure to have a basket of fresh chips on hand to scoop it up with, and I recommend you wash it down with an ice-cold beer (try Bohemia Clara). 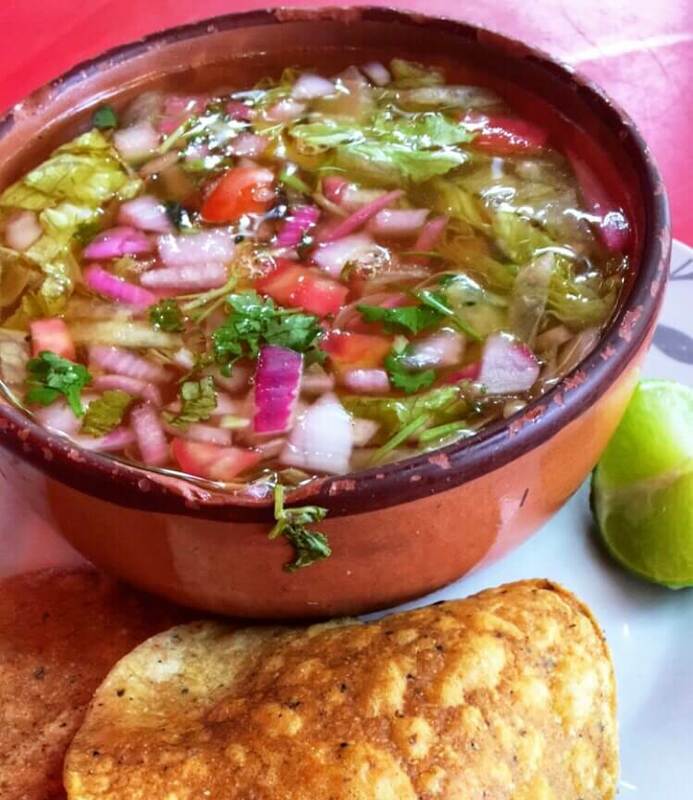 Where to find: Catrin in Merida serves a really great version. For this dish, pork meat is marinated in citrus juice, achiote and other spices. Then, it’s wrapped in banana leaves and buried underground. When it emerges, the achiote has imparted an orangish color, and the meat is so tender it’s falling apart. The meat is then used as everything from a taco topping to sandwich filling. This is a must try, as it’s a very typical Mayan dish. Where to find: This is another dish you can find nearly everywhere, from street stalls to high-end restaurants. My favorite version was at the market in Parque Santa Ana. 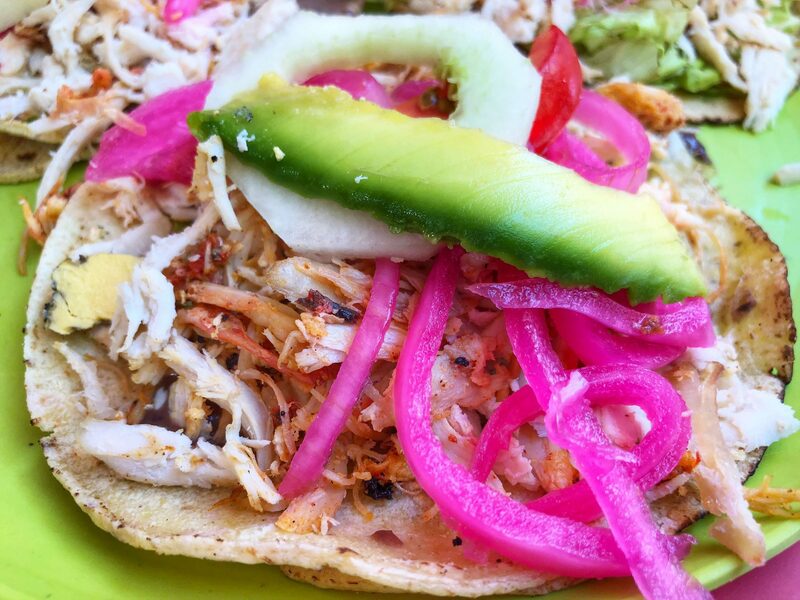 Turkey is surprisingly one of the most popular meats in Yucatan cuisine. While I’ve grown used to having turkey twice a year on holidays, in the Yucatan, you’ll find whole roasted birds lining the display cases at markets and being carved up for dishes ranging from sandwiches to tacos! I have to admit that I wasn’t too sure about this dish when they set it down in front me. Tortillas topped with eggs, black beans, cheese, diced ham, peas and fried plantains. What? But somehow, it actually works. And, even if it’s not your new favorite dish, it’s interesting to say you’ve tried it! Where to find: If you can make it to the Yucatecan town of Motul, the restaurant Dońa Evelia is said to have invented the dish. If you can’t make it there, any mercado in the region will likely serve the dish. 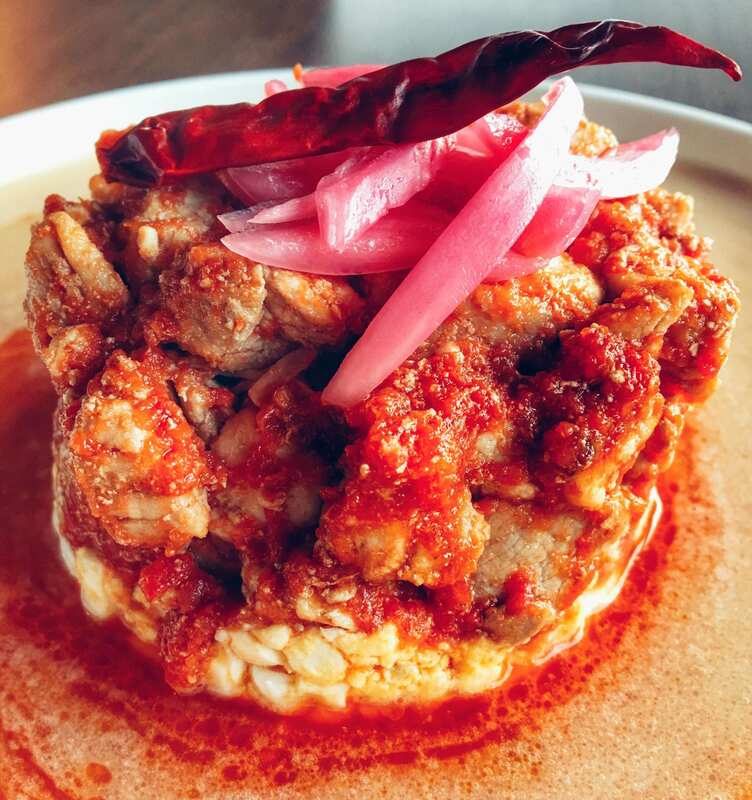 This dish is made up of masa balls baked with butter, stuffed with your choice of meat (often cochinita pibil), beans, and topped with onion. Often a piece of hard-boiled egg is added before smothering as much habanero salsa on it as you like. 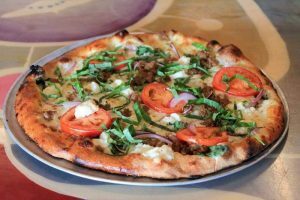 If you find a place that does this dish, the dough will be crunchy. Pibihuas makes for a crispy, salty, spicy perfect bite of food! Where to find: As far as I know, these are only found in Valladolid, where we found them on a road trip with help from a local friend. You can find them in the main market, Mercado Municipal, but the best versions are out on the street in small food carts that quickly sell out each day. A note about road tripping/renting a car in Mexico: your credit card benefits from back home may not always follow you to Mexico. Make sure you’re covered with an additional car rental insurance policy. 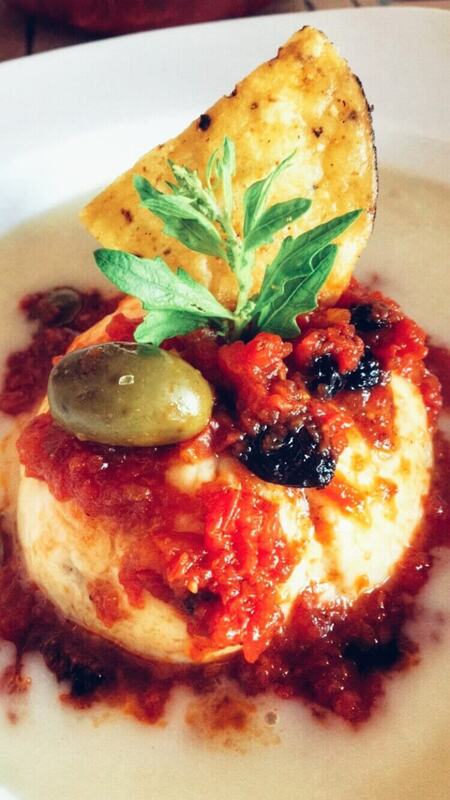 This Mayan fusion dish has a heavy influence from the Dutch, as the key ingredient (Edam cheese) is obviously not local. The cheese is hollowed out and filled with a mixture of spiced minced pork. It’s then topped with not one, but two sauces — one red and the other white — before being finished off with olives. This creamy, melty, cheesy, salty dish is one of my favorites, and one I had to stop myself from ordering three times a week! Where to find: The best version I found was at Manjar Blanco in Merida. Planning to visit Merida, Mexico? Check out this list of the best Merida restaurants! Thinly sliced pork that’s marinated in citrus juice before being quickly grilled, Poc Chuc is another signature dish of the Yucatan. I like to have mine with beans and rice, avocado and (of course) pickled red onion. I usually stuff the entire mixture into tortillas to make a taco of sorts. 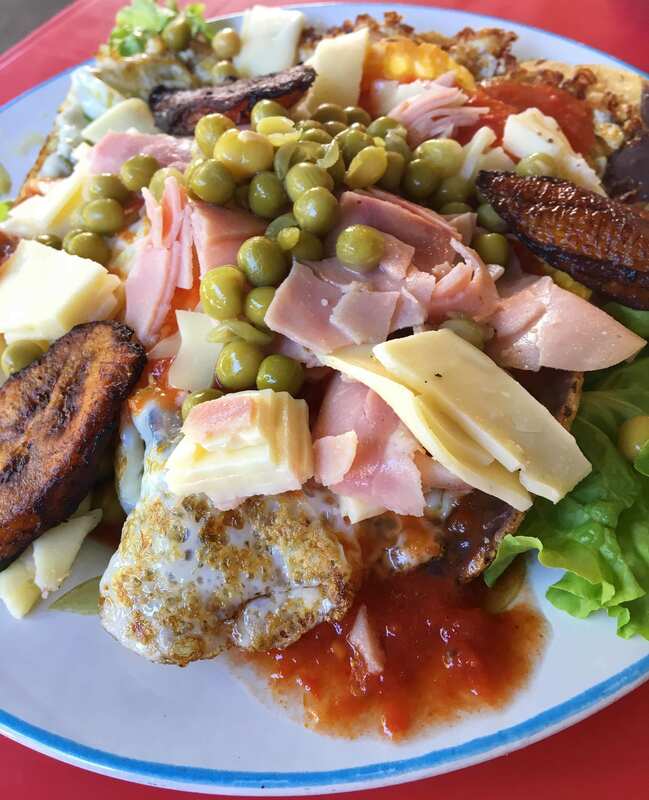 Where to find: I’ve had this for breakfast many times at Parque Santa Ana in Merida. It’s a simple, straightforward version, but it’s full of flavor! Kibis are a lot like Lebanese falafel, and for good reason. The dish has been adapted from the falafel Lebanese immigrants brought to the area. Rough ground wheat dough is stuffed with ground meat before being deep-fried. 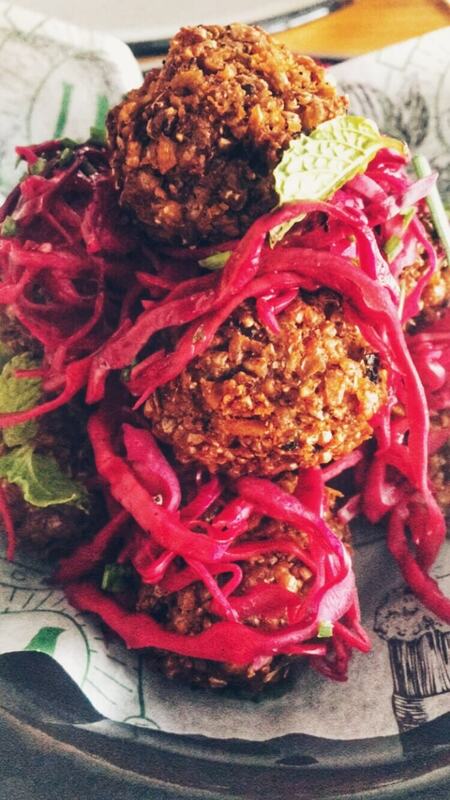 You then top the crunchy fried balls with a salad of cabbage, red onion, sour orange and habaneros (if you like spice). Where to find: the best kibis I’ve ever had were sold from a basket on the beach in Progreso. But, if you want a high-end version, La Linda makes great kibis! Slow roasted pork and chopped boiled eggs in a slightly spicy garlic tomato sauce — this mixture begs to be squeezed into fresh tortillas. Where to find: Even though it’s a signature dish of Valladolid, the best version of this I’ve ever had was at Manjar Blanco. And yes, I did try them in Valladolid! Which Yucatan food do you most want to try? Let me know in the comments section below! Do you mean “Kibis” are a lot like the Lebanese national dish “Kibbeh”. Both made with cracked wheat (bulghar), ground meat and spices. Sounds almost exactly like the standard recipe- more so than falafel. Can be eaten raw, baked or fried. Yes, exactly! The local kibis are an adaptation of the Lebanese dish- there’s a large Lebanese population in Mexico! I have had the pic chuc at the restaurant in Mani you mentioned. It was indeed fabulosa! I’m glad you liked it! I love poc chuc. Was it your favorite local dish? Aside from Huevos Motuleños and fried and Pulpo Frito Ceviche, I’ve tried all of them. There is the raw version of Pulpo Ceviche (the fried version is technically not Ceviche in my opinion because it’s not raw). If you were in Valladolid you missed Longaniza. The Valladolid version is legendary. What’s my favorite? that would be a hard choice, it would be a toss up between Salbutes, Panuchos, Kibis, Cochinita pibil, Queso Relleno. Btw, there are two versions of Queso relleno, there’s the one made in broth (turkey – not chicken ) and Queso relleno en pebre. This last one is basically the same broth but thicker version. Thick like a Champurrado but not sweet. I’m not sure what they use to make it thicker. Personally, I don’t like this thicker version but lots of people love it.